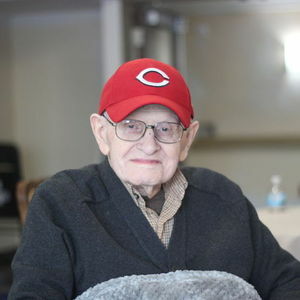 James M. "Jim" Thompson, 106, of Pendleton passed away on March 24th at Rawlins House in Pendleton after a sudden illness of 7 days. He was born on March 2, 1913, in Ekin, Tipton Co., IN. to Ludovic E. and Mary F. (Sharp) Thompson. He graduated from Goldsmith High School in 1931 and moved to Anderson in 1935. He retired from Emge Meat Packing Company after 45 years as a salesman. He never missed a day of work. He was a member of First Baptist Church of Anderson. He was a member of Mt. Moriah Masonic Lodge No.77, since 1944, Indianapolis Scottish Rite, Past Worthy Patron of the Order of Eastern Star No. 154, Anderson Noon Lions Club, White Shrine and Order of the Amaranth. He held the record of buying 55 new cars from Reginald Pontiac and was known as the "Bonneville Man". He was an avid bowler and a fan of the Cincinnati Reds and the Indy Pacers. Pacers mascot, "Boomer", entertained at his 100th birthday party. He was well known for his singing in church choirs, weddings, and funerals. He was the honorary soloist for the Mt. Moriah Masonic Lodge. He is survived by his daughter: Karen (Phil) Hollingsworth of Anderson, grandchildren: Jon (Karen) Hartley of Pendleton, James (Naomi) Hollingsworth of Pendleton, Jessica (Mike) Robertson of Fishers, 6 great-grandchildren, and 3 great-great grandchildren. Also surviving is his step-daughter: Debby (Greg) Kopp of Ft. Myers, FL., step-grandchildren: Stephanie (Joe) Ruffin of Anchorage, AK, Becky (Scott) Hessong of Plainfield, 4 step-great-grandchildren, and several nieces and nephews. In addition to his parents he was preceded in death by his 1st wife: Eva (Palmer) Thompson, 2nd wife: Virginia (Toye) Lewis Thompson, son: Robert G. Thompson, sisters: Pearl Pickett, Esther Lewis, Hattie Douglass, and brother: Loyze Sharp. The family wishes to express their gratitude to Dr. Robert Anderson, Fall Creek Retirement Village, Rawlins House, and Paradigm Hospice. Services will be 1 p.m. Thursday at the First Baptist Church of Anderson, 907 N. Raible Ave. with Rev. Art Jaggard officiating, preceded by an Eastern Star service. Burial will follow at the Union Cemetery, Atlanta, IN. Memorial contributions may be made to the First Baptist Church of Anderson.